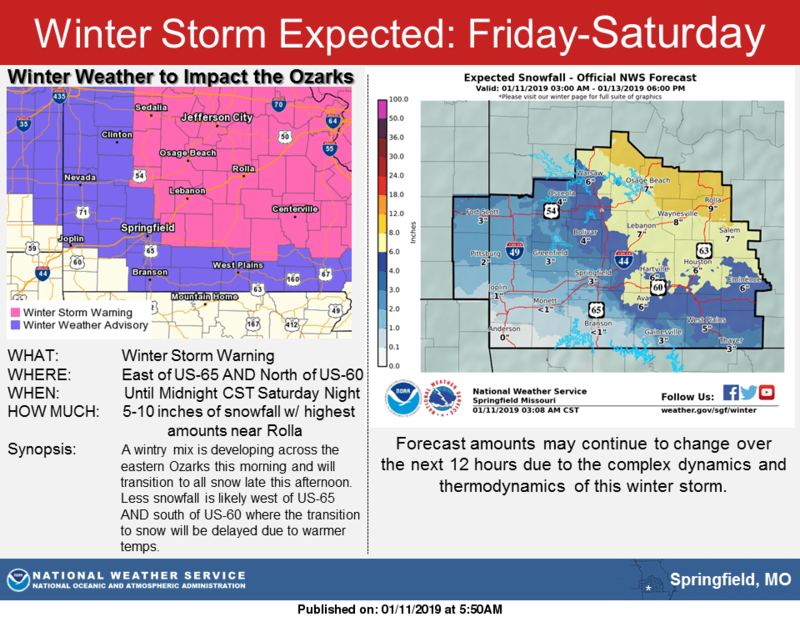 A winter storm is taking shape in the eastern Ozarks, central and south central Missouri Friday and Saturday. The National Weather Service has issued a winter storm warning for Dallas, Hickory, Laclede and Wright Counties until midnight Saturday night. Forecasters say five to ten inches of snow are possible in these areas, which will create significant travel impacts by late Friday afternoon and especially this evening through Saturday. For the rest of the Ozarks, including the Springfield metro area, a winter weather advisory is in effect from now until midnight Saturday night. A wintry mix is expected in these areas, with one to four inches of total snow accumulation. Minor sleet accumulations are also expected with a light glaze of ice. We’ve already had some minor ice accumulations reported Friday morning in the Ava, Hartville and Mansfield areas. Forecasters say two to three inches of snow are possible in Springfield, with much of the wintry precipitation in the metro area expected later Friday evening into Saturday. Other projected snowfall amounts include four inches in Bolivar, six inches in Ava and Hartville, seven inches in Lebanon, eight inches in Waynesville, and nine inches in Rolla. Four inches are forecast for the Bolivar area up Highway 13 toward Osceola, with three inches expected in Greenfield, and less than an inch in Branson and Monett. One inch of snow is forecast in Joplin. Stay up to date on the latest weather information on 94.7, KTTS and get the latest forecasts and track interactive radar by downloading the new KTTS app.